Cool creamy blonde - milky blonde without any brassiness or gold, a sophisticated soft blonde. The truely intelligent blonde. Full mid-length to ends for luxurious volume. Each pack weighs aprox 50 grams per half head or 100 grams per full Head. A standard full head set of 100 pieces equals a weight of 100 grams. This is the thickest extension weight on the market for this method of attachment, supplying the best value for money. Our hair extensions look completely natural, meaning you can style your hair freely and even wear your hair in high ponytails when positioned correctly. Half Head 50 PCS - 1 gram per piece. Full Head 100 PCS - 1 gram per piece. HAIR CARE: Our beautiful hair extensions are made with 100% pure virgin remy hair, so you can wash, cut, curl, straighten and style this hair just as you would your own hair. You can also tone your new hair as well as using a semi to colour them hair darker. 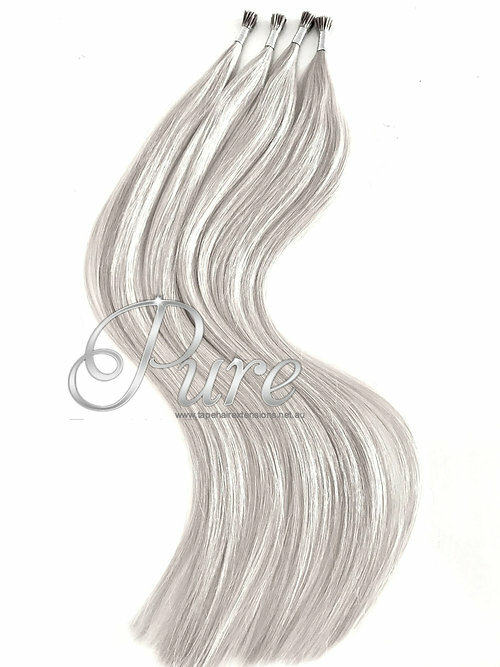 #SILVER - METALLIC SILVER BLONDE RUSSIAN GRADE TAPE - IN HAIR EXTENSIONS 22" #SILVER - METALLIC SILVER BLONDE RUSSIAN GRADE TAPE - IN HAIR EXTENSIONS 22"
#GUNMETAL GREY - METALLIC SILVER GREY - LUXURY RUSSIAN CLIP IN - 200 Grams 22" #GUNMETAL GREY - METALLIC SILVER GREY - LUXURY RUSSIAN CLIP IN - 200 Grams 22"
NAIL-TIP / KERATIN BOND HAIR EXTENSION #CREAMY BLONDE - LIGHT CREAM BLONDE 22" NAIL-TIP / KERATIN BOND HAIR EXTENSION #CREAMY BLONDE - LIGHT CREAM BLONDE 22"